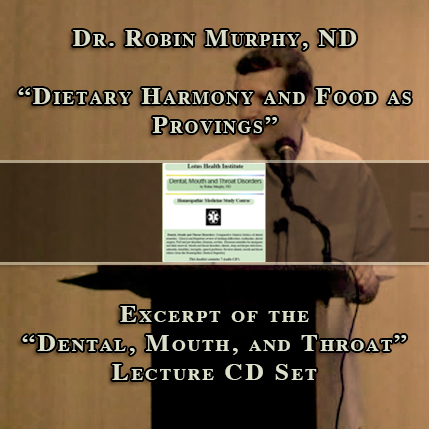 This podcast is an excerpt from Dr. Robin Murphy, ND's "Dental, Mouth and Throat" Lecture CD Set. Dr. Murphy discusses the dietary harmony and food as provings. Comparative Materia Medica of dental remedies. Clinical and Repertory review of teething difficulties, toothaches, dental surgery, TMJ and jaw disorders, bruxism, cavities. Discusses remedies for amalgams and their removal. Mouth and throat disorders, thrush, strep and herpes infections, adenoids, tonsillitis, laryngitis, speech problems. Reviews dental, mouth and throat rubrics from the Homeopathic Medical Repertory.